The Iraqi military has denied the participation of foreign troops in the upcoming operation to liberate Mosul from the hands of Daesh terrorists. “Troops participating in the plan to liberate Iraqi cities, including Mosul, are purely Iraqi,” said spokesman for Iraq’s Joint Chiefs of Staff Brigadier General Yehia Rasoul on Sunday. He noted that forces taking part in the operation will namely be the Iraqi army, anti-terrorism forces, the federal police, and the Popular Mobilization Units. “The presence of the international coalition forces is meant for intelligence exchange, carrying out airstrikes against Daesh and training and arming Iraqi forces,” he added. Rasoul made the announcement after media reports that the US was seeking to send 500 more troops into Iraq ahead of the operations to retake Mosul. Over the last few months, Iraq has been preparing for the assault on Daesh in Mosul, the country’s second largest city which slipped into the hands of the terrorists in the summer of 2014. 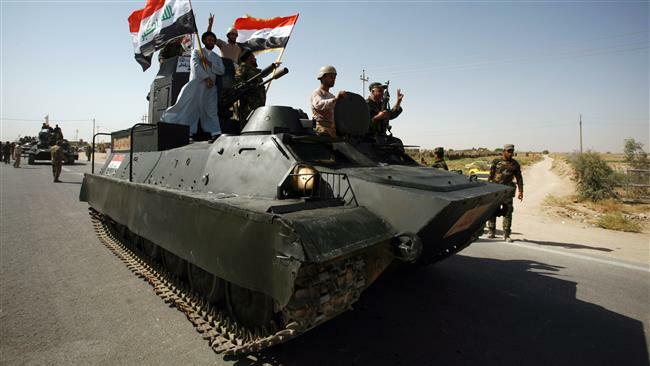 Government forces have managed to recapture all the other places that Daesh had seized, with the last major one being the city of Fallujah, about 50 kilometers west of the capital Baghdad, which was liberated in late June. Members of the Popular Mobilization Units supporting Iraq government forces drive military vehicles on the outskirts of the holy Iraqi city of Najaf on September 24, 2016. Violence has plagued the northern and western parts of Iraq ever since Daesh launched an offensive in the country in June 2014, and seized territory. Iraqi army soldiers and fighters from allied Popular Mobilization Units are seeking to win back militant-held regions in joint operations.